Being a fan of the classic NES Duck Hunt, I have been anxious to test out this new live action mechanical version from Hammacher Schlemmer. I'll say this: It's fun while it lasts. Who wants to hunt some ducks? I said, WHO WANTS TO HUNT SOME DUCKS?? Available later this month for $30. I've never hunted actual ducks, but I would imagine that the real experience offers up a similar (albeit more intense) mixture of fleeting thrills, unpredictability and satisfying violence as the game—except this way you don't actually have to kill anything. Plus the action sounds the gun makes when pumping the forearm and pulling the trigger are a nice touch. As I mentioned earlier, this game is fun in short increments. The typical flight lasted anywhere between 5 and 15 seconds depending on how I set the directional control pad near the tail. As you can see in the videos above, setting the tab for a straighter flight tends to keep the duck up in the air longer while setting it more to the left or right results in shorter, more compact flights. Either way, the flights were inconsistent and it was difficult to get hits before the duck glided naturally to the ground. They say you can play this game indoors, and that's probably true if "indoors" happens to be a gymnasium. 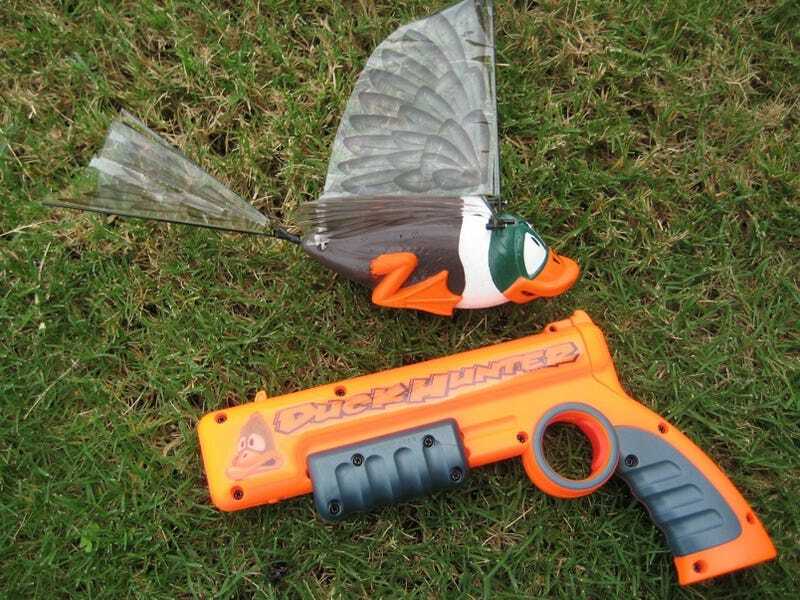 You will break Duck Hunter. Seriously, even if you didn't get tired of the game after a few hours of flying, you will probably break it well before that. The infrared gun feels cheap and the bird is nothing more than a piece of styrofoam with a few bits of plastic and wings that have about the same tensile strength as masking tape. Every time I pushed the duck down on the charging post located on the barrel of the gun I thought I would snap something. And that happens a lot because you need to charge it for 10 seconds after each flight. The $30 price tag isn't a fortune, but that's probably more than you want to spend on something that will end up forgotten or broken in a few weeks. Early on, there was talk of a premium, $40 version that could be remotely controlled by a second person—I'm not sure what happened with that, but it might have been a worthwhile upgrade. Definitely feels like a live action version of the Duck Hunt NES game. Gun sounds and the mid-air "stumbles" when the duck is hit are a nice touch. Flights are inconsistent. Patterns are hard to contain, so it is best used in a large open space. The equipment feels cheap and fragile.